A few years ago, newly returned to the workplace after some time away, I attended several digital marketing courses where the course leaders casually mentioned that email newsletters were a dying breed and not part of today’s digital toolkit. Controversial. The positioning was, that in today’s world of analytics and talking to our customers throughout their life cycle, this was a poor way of communicating to our customers and prospects. It would not be targeted enough and it would be difficult to target the customer with the right message for the right stage in their journey or life-cycle. They then tended to turn the argument round to talk about how to make those opportunities to talk to customers more valuable, rather like this article from Forbes last year. Of course email marketing is more complex than sending out a monthly newsletter, but there is still a place for newsletters and post GDPR, I have several that I look forward to receiving. It turns out, I am not alone. 83% of B2B marketers still use email newsletters as part of their content strategy. What are the benefits of maintaining email newsletters for your business? Your client or prospect may not have seen all those fantastic blog posts or social medai messages that you have published with valuable information to help them run their business. By most reports, the ROI for email marketing is twice that of other digital channels. Everyone is busy with life and work so as long as you are providing valuable content, it can only be a benefit to share that content in multiple places. Newsletters are another way to demonstrate your brand personality and for people to get to know you a little better. The old adage of “people buy from people” is just as true today as ever and by talking to your customers through your newsletter you can help build trust. One example I can share is of Sophie Livingston of Kickstart Content. Everything Sophie writes feels like it has been drafted with me (a freelancer) in mind. She is expert at writing intentional content and is wholly focused on her niche which is indpendent small business owners. Her newsletter is a great example of this approach and I know without having met her face to face that I would trust her with work for me or my clients. In today’s post GDPR world, people who have hit the subscribe button genuinely want to hear from you. With clients that I work with I now regularly see open rates of well over 60% for their email newsletters and campaigns. Another newsletter that I look forward to reading is Sophie Carefull who I first came across through the Small and Mighty Instagram stories challenge and then went on to work with for my brand photography. 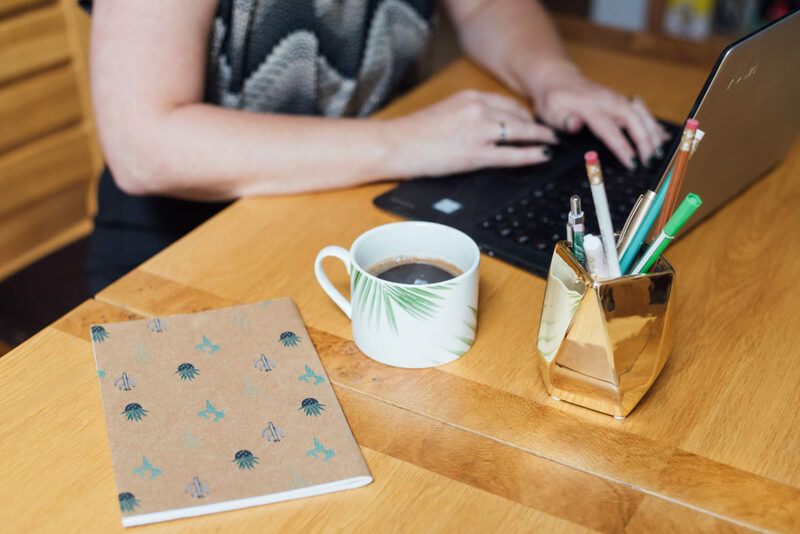 Sophie Carefull is a Personal Branding Photographer who always shares thoughtful emails that are relevant for her ideal client, whether that be tips on great photography or how to run a business. She also shares a couple of freebie photos which are always beautiful and also are a great teaser for potential customers to go to her stock photography shop too. How do you make your email newsletter relevant? Keep it short and sweet – focus on three key messages and be respectful of people’s time. You don’t need to re-invent the wheel – go back and look at which of your blog posts or social media messages have generated the best engagement and focus on re-purposing that! Share best practices or industry news – If you have recently had a great project or read about something interesting in your niche then look to share that with your readers, you can link to the article if its written by someone else, or provide your own thoughts. Tell your reader when they will hear from you again. This is the easiest advice to hand out and the hardest to stick to. Where possible try to be regular and try to stick to a consistent schedule. If you know that a weekly newsletter is out of the question, plan to send out a monthly or even a quarterly one so that your readers will know when they will hear from you again. Make it easy to take action – Add in a Call to Action and links to your website or offers. Many of the email platforms make it easy to do this with handy templates. What do you want your reader to do after receiving the newsletter – it may be that you have a special offer you would like them to consider or a longer blog post you would like them to read, be sure to tell them! If you need some help with your newsletters or email marketing, please get in touch. One of my goals this year is to practice what I preach so I will be starting my own email newsletter in Q1. Feel free to subscribe below or drop me an email with any topics you might like me to cover.